Adukku Pathiri / Athishaya Pathiri, as the name suggests its a wonderful mouth watering traditional malabar dish. Adukku pathiri is a layered (‘adukku’ in malayalam) combination of veg or non veg or sweet ingredients and spices. Athishaya pathiri is a main cuisine in malabar areas for their routine festivals. Here we are experimenting a non veg combination of athishaya pathiri which can be made of either chicken/ beef. Cook the meat with coriander powder,turmeric powder, chilly powder and salt till it is tender and the water is absorbed. Heat 1 tbspn ghee/ oil and saute onion, curry leaves and green chillies.Fry till the onion turns transparent. Add ginger-garlic paste, saute till the raw smell disappears. Then add cooked,minced meat and cook till dry. Add the chopped coriander leaves, garam masala powder, chopped cashew nuts and raisins (keep some for garnishing).Keep it aside. Beat the Eggs well using a fork. Now add salt and pepper powder and mix well to prepare the egg mixture. For making the pancakes, make a thin batter with the flour,eggs,milk and salt. If the milk is not sufficient,then you can add little water. 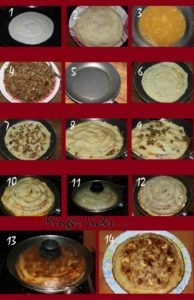 Heat a frying pan and pour a laddle of batter and turn the pan in a circular way to form a thin pancake. No need to flip over ,remove it. Finish all the batter the same way.Keep aside. For layering the Adukku pathiri/ Athishaya pathiri, Grease a heavy bottomed non stick frying pan with 3 tbsp ghee. Take a pancake and dip it well in the egg mixture. Put it in the pan and place a thin layer of minced meat mixture over it. Cover this layer with another pancake dipped in egg mixture and proceed thus till all the pancakes have been used. On the top layer pour the remaining egg mixture. Cover with a heavy tight-fitting lid. keep it for about 10 – 15 minutes on lowest flame till it is cooked and light golden brown on top. Now slowly flip the pathiri onto a flat plate, and then flip it again on another plate and back into the pan for cooking the top portion properly. Keep it for another 10-15 minutes. Make sure the flame is low. 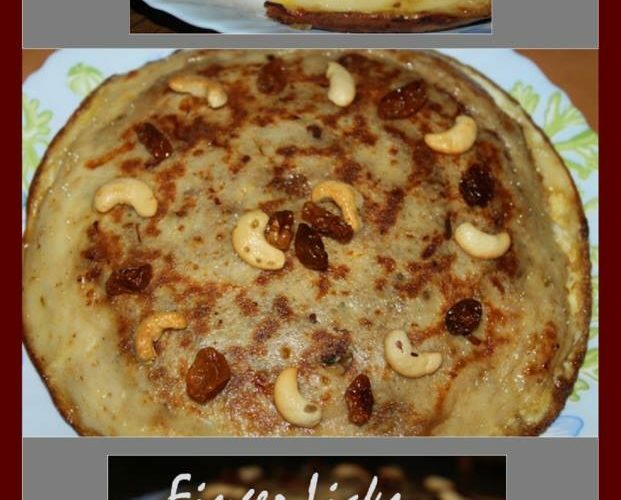 For serving, flip it onto a plate and sprinkle the roasted nuts and raisins and cut it like a cake and serve hot.